Santa Margalida is a municipality of the Balearic Islands, located to the northeast of the island of Mallorca, in the abbey of Alcudia. It is a perfect enclave to spend your summer vacations staying in a rental apartment, villa or chalet, because this area is characterized for its 9 kilometers of sandy coast, without dangerous rock formations. Santa Margalida is a small, quiet and traditional village inhabited by cheerful people, where you will enjoy the authentic Mallorcan atmosphere. Plaza de la Villa is the nerve center of the town's social life, where the market and most festive events are held. It is also where you can find most of the bars and restaurants to try the best dishes of the island. We recommend paying a visit to the parish church, the most important building of Santa Margalida, located on a hill in the original nucleus of Santa Margarita of the thirteenth century. There are also plenty of things to do if you are staying in an apartment, chalet or holiday villa in Santa Margalida: to start, you can tour all the coves on the island in a rental car or a rental boat and discover the immense beauty of the island of Majorca. The cuisine of Santa Margalida is based on seafood, as it follows the most typical Mallorcan tradition and is genuinely Mediterranean. So, if you are staying in a holiday rental apartment in Santa Margalida, try the trempó, which is the Mallorcan salad par excellence, the turbet, another typical summer accompaniment made with potatoes cut into thin slices, eggplant and peppers, all fried and covered with tomato sauce. You can also try the brut rice, Mallorcan soup, sobrasada with honey, frit mallorquín, baked fish or snails. Indeed, it is a luxury area on the island of Mallorca. It is also the ideal corner from where to discover Mallorca, as staying in a rental apartment in Santa Margalida, you can travel the island either by car or by public transport. Being a small population, Santa Margalida has a calm and relaxing atmosphere. Santa Margalida is a very good option for traveling with children: many of the chalets, villas and tourist apartments have a garden and pool, the beach is sandy and shallow, and it features lifeguards and showers. It also holds the blue flag of the European Union. The atmosphere of the locality is family friendly, calm and pleasant. Undoubtedly, your children will be able to run around the village with total tranquility. They will surely have nice memories of the summer. If you are staying in a rental apartment in Santa Margalida with your children, we recommend you to visit the capital of the island, Palma de Mallorca, and take them to spend a fun day at a water park. There are many and varied fun things to do on the island, which you can enjoy by staying in a holiday rental apartment in Santa Margalida. You can reach the island of Mallorca by plane and by boat, which will take you to Palma. From Palma de Mallorca, you can reach Santa Margalida on any of the buses that pass frequently from the airport. By car, the approximate distance is 50 kilometers. Without a doubt, renting a holiday apartment in Santa Margalida is the perfect option because, in this small and quiet town full of charm, you and your family and children will enjoy a summer vacation in a fully equipped rental apartment ideal for families, since most holiday rental apartments in Santa Margalida have a swimming pool, making it a perfect place to travel with children, who will surely have a great time! We assure you that, in Santa Margalida, you will find your ideal accommodation either in a holiday apartment, in a rental villa or a rental house with pool. 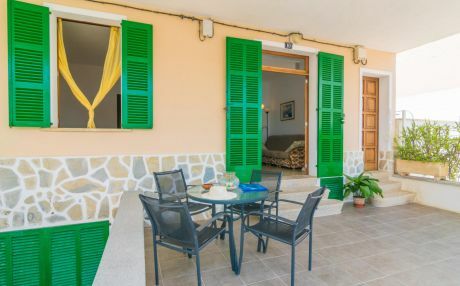 The advantages of booking your holiday accommodation in Santa Margalida are many: you will be very close to the beach and very well connected to the rest of the towns of Mallorca, including, of course, its capital, Palma. Plus, everything is convenient when renting a holiday apartment: no time schedules to follow, total freedom, there is more space for the whole family, you can cook your own meals and, of course, it comes out much cheaper than other holiday accommodation options. There's no doubt that the best option is to rent an apartment, house or villa in Santa Margalida. We have at your disposal a wide accommodation offer including houses with communal pool, apartments with pool, beautiful villas with private pool, and much more. Ask us and we will help you find the perfect holiday rental accommodation in Santa Margalida for you.